ALBANY, La., October 5, 2018 – More than just another dental office, Albany Dental Care celebrates its patients every day. From its patient of the day recognition program to provide 10 percent off for military heroes, Dr. Randy Mayer and his caring staff realize the community is the reason Albany Dental Care has provided over four decades of dental health to the Florida Parishes. With a focus on family dentistry, Albany Dental Care recognizes patients of all ages. Dr. Mayer and his team provide an atmosphere inviting all generations to see why this dental office is unlike its traditional counterparts. Fall children’s appreciation programs began with Albany Dental Care giving backpacks away leading up to the 2018-2019 school year. Albany Dental Care also gave away Play-Doh Gift Packs in anticipation of Play-Doh Day on Sept. 16. Children also enjoyed the staff dressing up for National Tooth Fairy Day in August. In appreciation of all dedicated patients, Albany Dental Care has a Patient of the Day program to help patients acknowledge events such as getting braces off, bravery through an exam or procedure, or simply a patient starting a new life adventure. Albany Dental Care also celebrates anniversary years with patients – watching closely to see when it can acknowledge milestone years of keeping patients smiling. 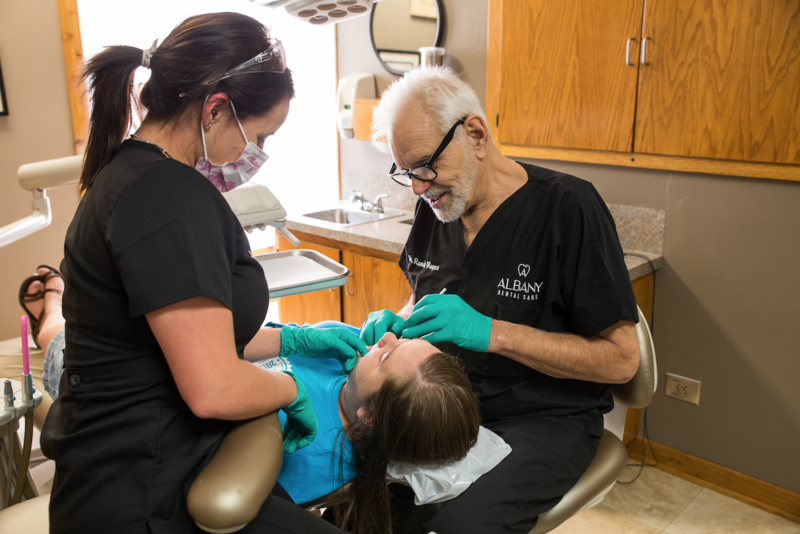 All in all, participation in community activities and patient milestones are built into the culture at Albany Dental Care. Their team has brought 45 years of dedicated service to Albany and the surrounding area. For more information, visit albany-dental.com.